What ever happened to German’s web site? Last I heard, he had shoulder surgery and was going to take a break from shooting. That was a couple of years ago. I hope he’s doing well, his articles were very informative. Back in the 1980’s, before the cartridge’s dimensions were standardized in 1989, I used a batch of .308 brass that was intended to be reformed to the 6mm Remington BR. Remington produced the brass, head stamped, “R-P Rem BR”, that had especially thinned shoulder and body thickness, and used a small rifle primer pocket, although with a .080″ flash hole. Formed full length into 7mm IHMSA, loaded with my 140 grain jacketed open point bullet, H-322 powder and a Remington 7-1/2 primer, it was phenomenally accurate in a bolt action Wichita Pistol. Interesting how old forgotten things become the next great thing decades later. Still, worth experimenting with a few to see what I can come up with. I have necked down 308 Palma brass to 260 so I could go to higher pressures without loose primer pockets, ala 6mmBR. The best primer for that is the CCI 450 small magnum rifle primer. That primer cannot set off 40 gr of CFE behind a 120 gr bullet, but will not set off 42 gr. Small primer pockets are good for high pressure. Large primers are good for igniting powder. thank you heaps, i have been thinking about the possible benifits from a larger burn front through a certain size flash hole for some time . 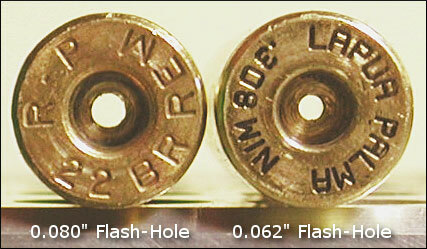 primer type /powder type / flash hole size and case diameter .thank you for your article . I use the Lapua Palma .308 brass with a CCI 41 primer for Palma with the 155. Works very well. SD in the single digits. The brass is tough and has a lot of mass in the head. Weighs a average of 172 grams and all has been + or – a gram even from different lots. Makes three nice batches. Lasts forever. Primers are cheaper and easier to get. It has a PPC type small flash hole so the dies primer pin has to be changed on all .308 dies to deprime and avoid ruining the case. Important point not usually mentioned. A bit of a hassle when you get into collect dies that have to be turned down at the pin and so called universal decappers. Still I wouldn’t go back,,,good stuff. I shoot f class. I shot ftr 308 and f open 284 win 6 BR also. Last year I started having pressure problems with the BR. I had to drop 2 full grains in powder to cope with it. What it ended up being was my new dies had the large decapping pin and was enlarging the primer hole. Only after much head scratching did I finally realize the core of the problem. I learned a lot about primers and flash hole size affecting accuracy and pressure. All said I much prefer small hole and primers for accuracy. Excellent read . As the author concludes , there appears to be little to no difference in result , regardless of which primer used . Personally ; I suspect variations in SD / ES have more to do with slight variations in particular loading practices ,simply because of the nature of reloading . Types of powder ; temperature , and altitude could all have more effect on SD and ES than the primer , when comparing the photo’s shown above . So in theory, the narrow flash hole results in the flash igniting more powder faster than a normal size flash hole does. Would the result be the same with a faster burning powder and a normal size flash hole?